Polyurethane is quite commonly used to protect your outdoor wicker furniture. According to Wicker Paradise, it is essential that you should know a few things before using polyurethane. Polyurethane requires more drying time after the final coat than it does between application coats, so it is important to remember that you don’t rush the process. Make sure that the poly is allowed to cure. Before using polyurethane, remember that it is a two-day project and requires some gap between applications and drying time. Polyurethane is usually clear when it dries, but can turn yellow slightly over time. When you are in the market looking for appropriate polyurethane for your furniture, then you can find a variety of spray-on polyurethane finishes. However, you must resist buying spray-on polyurethane for your wicker furniture. A brush-on application will afford you the precision you need to apply the finish thoroughly to wicker’s many nooks and crannies. Moreover, you will also have to encounter the problem of “overspray” that you will end up buying, and wasting, far more poly than you really need. Polyurethane is toxic and emits a strong odor and should be applied only in a well-ventilated or open area. 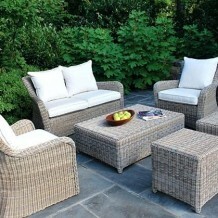 Never leave wicker furniture outdoors during prolonged periods of intense heat, rain and especially snow. Bring it indoors or at least cover it securely. Everything you need for your backyard in a single location, be it replacement cushions or our special Lane Venture outdoor furniture, is available at Wicker Paradise.